Man pages, abbreviation for manual pages, needs no introduction. Man pages are the form of software documentation that is available in almost all Unix-like operating systems by default. Using man pages, you can read the usage details of any Unix command. Also, there is Info pages that serves that same purpose as man pages does. Man pages are great for a quick reference, and if you need more in-depth, better organized information, then use the info pages. Today, we will discuss about a program named Pinfo that can be used to read Info and man pages in color. It is not just for displaying info/man pages in color, but also has many other advantages. Pinfo is a curses based lynx-style info and man pages reader. It is designed to match the keystrokes of lynx text browser. If you’re already familiar with Lynx/Links text browsers, you don’t need any guidance. Pinfo is very similar in use to lynx. It has the similar functionality and similar key movements of lynx. Unlike man and info mages, you can select links, follow them as the way you view a HTML page in Lynx browser. 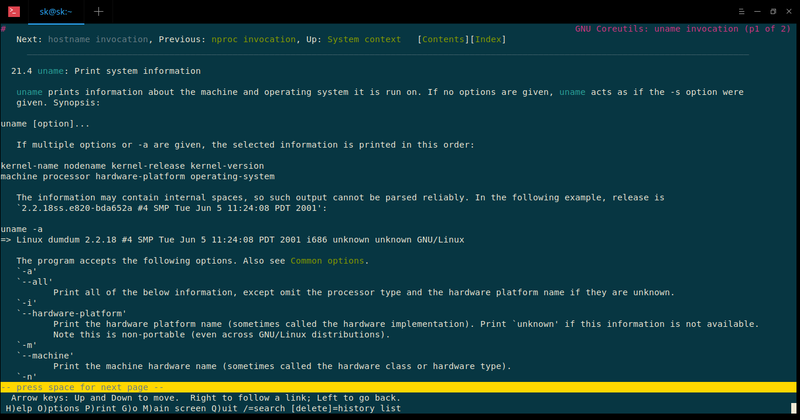 In this brief guide, we will see how to install and use Pinfo in any Unix-like operating systems. Pinfo is available in the default repositories of most Linux distributions, so you can install it using your distribution’s default package manager. Did you notice the colors and links under “REPORTING BUGS” and “SEE ALSO” sections? Yes, it looks much better now! We can just choose them using up/down arrows (click on the links using your mouse) and hit ENTER to follow them. Here is what I got after clicking on the last link. To quit pinfo, type q. For more details, refer the pinfo man pages. I like Pinfo and I’ve decided to stick with it for a while. It turns references to other man pages into links, and I can navigate them with the cursor and move back and forth, as in Lynx/Links. It makes navigating man pages much more efficient. Being able to scroll down to the “SEE ALSO” part, select something and press Enter is pretty good. Pinfo is particularly useful when you open the page for the wrong manpage section, such as “man write” when you meant to write “man 2 write”. And, that’s all for today! I hope you find this guide useful. More good stuffs to come. Stay tuned!